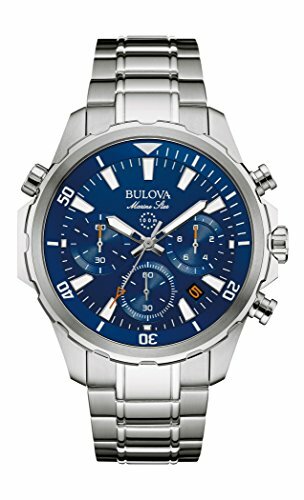 From the Marine Star Collection, this six hand Bulova chronograph watch features a calendar, stainless steel case with black IP accents, blue dial and flat mineral glass. 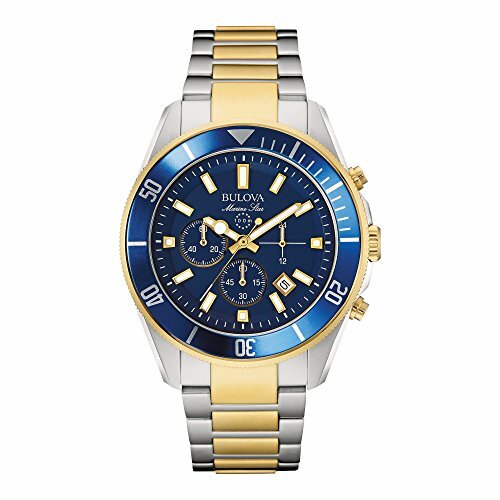 Make a splash with this handsome timepiece from Bulova's Marine Star collection. 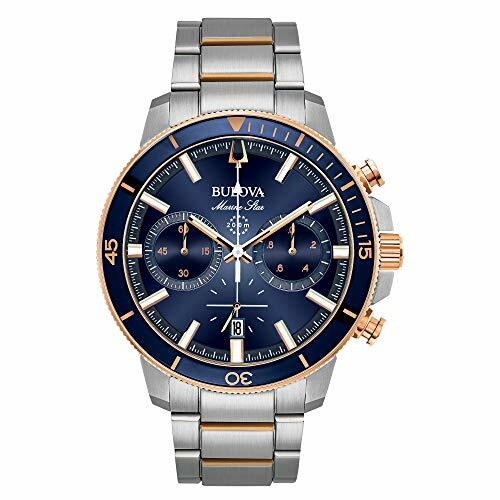 The watch is designed with a 45mm rose gold-tone stainless steel case with blue dial. The dial boasts three-hand automatic movement that can be seen in an open aperture, Roman numeral hour markers, flat mineral crystal, seconds sub-dial, luminous hands, and is water resistant to 200 meters. 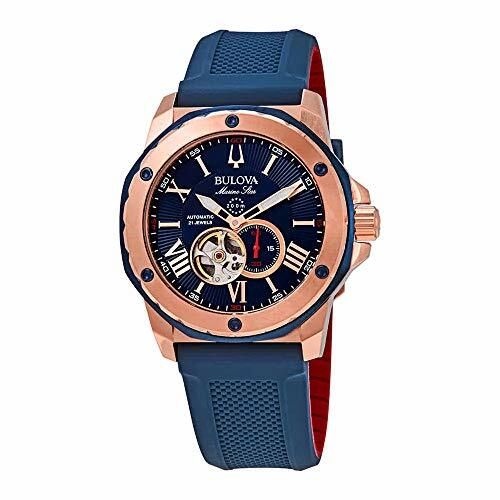 The watch fits comfortably to your wrist with a blue textured silicone strap with a contrasting red underside. 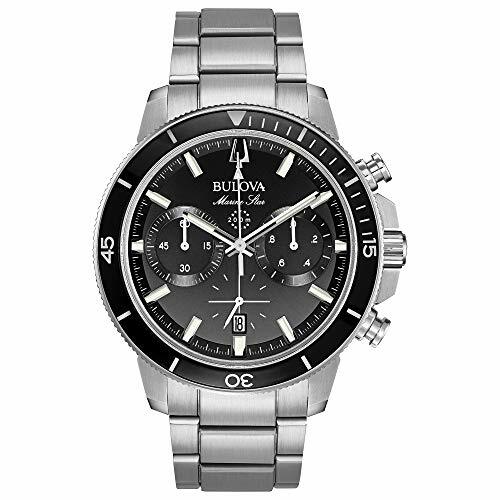 From Bulova, this men's stainless steel Marine Star watch is both handsome and practical. 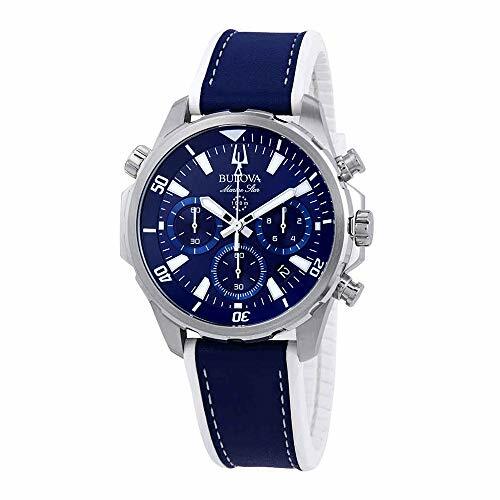 With the chronograph features and classic look, this timepiece is perfect not only for your favorite marine sport, but also for everyday wear. The black dial features chronograph sub-dials, luminous hands and markers, and a date window. 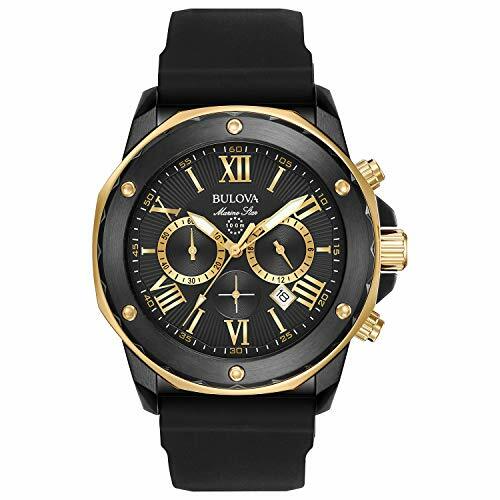 With a 45mm screw-back case, this 15mm thick bracelet watch features a fold-over buckle closure and a safety bar for added security. The timepiece is water resistant up to 200m, making it perfect for scuba diving and high-impact water sports. Black Dial with Luminous Hands and Markers. 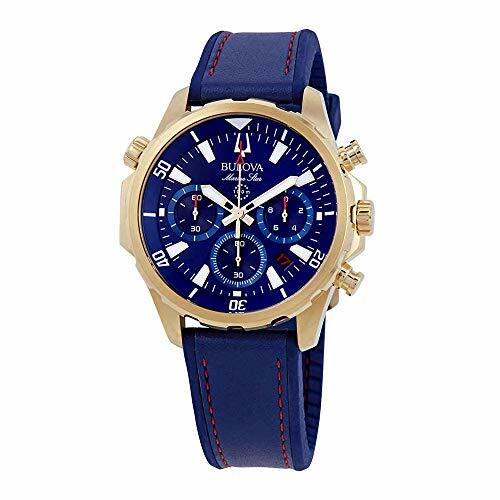 Chronograph Watch with Quartz Movement. Water Resistant up to 200m. Rotating Bezel. Calendar Feature. 45mm Screw-Back Case. Stainless Steel Bracelet Watch with Fold-Over Buckle Close. Safety Bar and Extender. 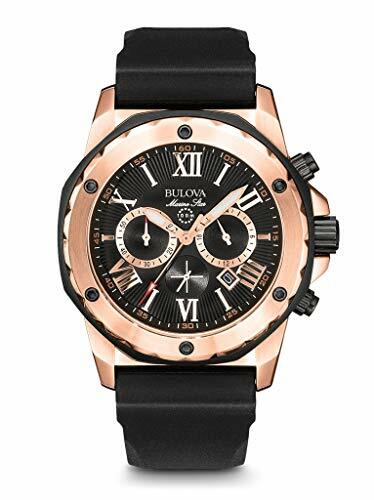 Bulova Style #: 96B272. 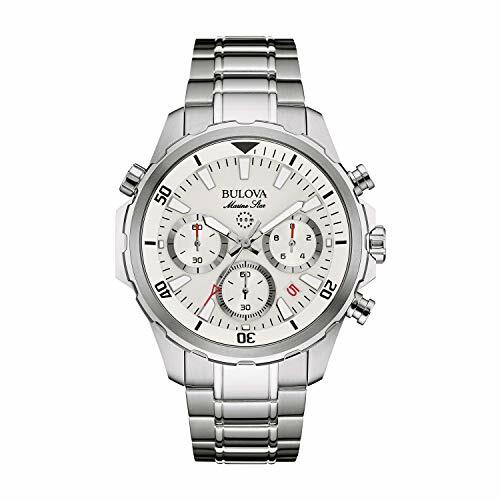 Part of the Marine Star Collection, this large Bulova watch offers the sleek and stylish appeal of silvertone stainless steel and fresh white accents. Note-Do not make this day/date adjustment when the time on the watch indicates between 9 P.M. and 4 A.M. as it will become incorrect due to the engagement of the changing mecha-nism. It would then become necessary to readjust the calendar.